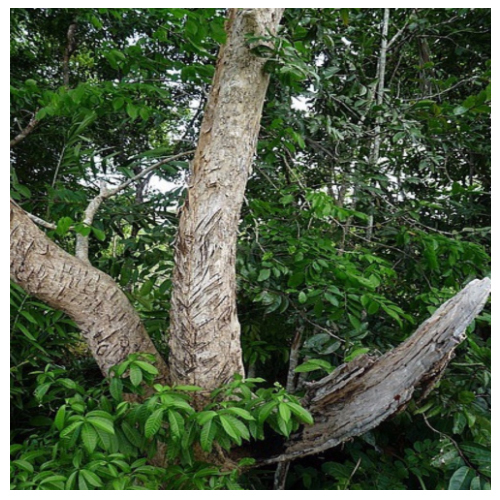 This Brazilian evergreen tree can grow up to 40 meters (125 feet) high and has a reddish bark and yellow flowers and is extensively felled in the South American rainforest, but now legislation requires distilleries to plant a new tree for each tree cut down. The wood is used for building, French cabinet making, carving, for the production of chopsticks in Japan and of course, essential oil. The oil has a slightly spicy, floral and sweet smell. Rosewood oil is extracted from Aniba rosaeodora (also known as Aniba rosaeodora var. amazonica) from the Lauraceae family and also known as bios de rose and Brazilian rosewood. It is extracted from the wood chippings by steam distillation. Rosewood essential oils normally blend well with one another, Rosewood oil blends especially well with all citrus and floral oils. The main chemical components of rosewood oil are a-pinene, camphene, geraniol, neral, geranial, myrcene, limonene, 1,8-cineole, linalool, benzaldehyde, linalool oxides and a-terpineol. Rosewood oil are anti-depressant, mildly analgesic, antiseptic, aphrodisiac, bactericidal, cephalic, deodo rant, insecticide and stimulant. Its aphrodisiac properties are useful to sort out sexual problems such as impotence and frigidity. It is an excellent oil to use in skincare, as it sorts out dull, dry and oily skin, while having a cell stimulant and tissue regenerating action on the skin which promotes rejuvenation of the skin. Rosewood oil is non-toxic, non-irritant and non-sensitizing oil and is generally regarded as safe. Rosewood oil does not have wide therapeutic properties, it has a place in aromatherapy and could help with the respiratory system, with sexual problems, with stress-related conditions and with great success for skin care. In vapor therapy rosewood oil can help with colds, coughs, infections, headaches, nausea and stress-related problems, while lifting depression. As a blended massage oil or diluted in the bath, rosewood oil can help with colds, coughs, infections, headaches, fevers and nervous tension, as well as frigidity and impotence, while giving the skin a boost. Aromatic Description Sweet, woody, fruity, floral aroma.